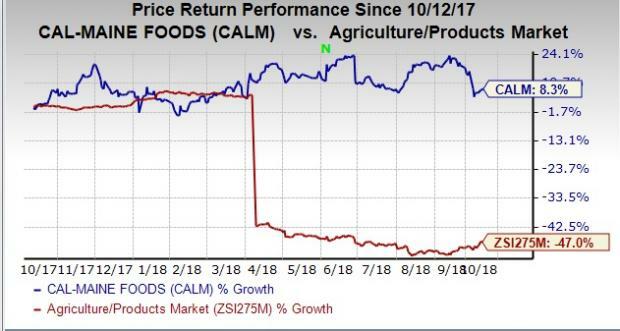 Cal-Maine Foods, Inc. CALM recently signed a definitive agreement to acquire the egg production, processing, sales and distribution business of Featherland Egg Farms, Inc., for an undisclosed amount. The buyout, likely to close in the next few weeks, will further strengthen the company’s acquisition-based growth strategy. Featherland Egg Farms is a premium Texas-based egg-farming company. Per the aforementioned deal, Cal-Maine Foods will acquire almost all the assets of Featherland Egg Farms’ commercial egg processing and production facilities. Aggregately, these facilities possess a capacity for roughly 600,000 laying hens. In addition to this, per the buyout deal, the company will secure the ownership rights of a feed mill, as well as all the distribution and production facilities of Featherland Egg Farms, near Marion, TX. Moreover, the production and distribution facilities of Featherland Egg Farms are located near the prime south Texas market areas of Cal-Maine Foods. Cal-Maine Foods engages in the production, grading and distribution of fresh cage-free, organic, conventional and nutritionally-enhanced shell eggs. Over the past year, the company’s shares have rallied 8.3%, as against the 47% loss recorded by the industry it belongs to. However, in the past 60 days, the Zacks Consensus Estimate for the company’s earnings remained unchanged at $3.35 and $3.50 for fiscal 2019 (ending May 2019) and fiscal 2020 (ending May 2020), respectively. This indicates neutral analysts’ sentiments toward this Zacks Rank #3 (Hold) stock. Cal-Maine Foods is poised to grow on the back of stronger demand for cage-free eggs, greater operational efficacy and superior customer relationships. Nevertheless, volatility in the market prices of agricultural and faming products remains a key cause of concern. Albemarle Corporation ALB sports a Zacks Rank of 1 (Strong Buy). The company pulled off an average positive earnings surprise of 6.56% in the past four quarters. You can see the complete list of today’s Zacks #1 Rank stocks here. Arch Coal Inc. ARCH flaunts a Zacks Rank #1. The company generated an average positive earnings surprise of 29.39% in the trailing four quarters. CF Industries Holdings, Inc. CF is another Zacks #1 Ranked company. The stock delivered an average positive earnings surprise of 44.58% in the preceding four quarters.